Alan Johnson has been entertaining patrons at Sydney and regional restaurants, hotels and clubs for more than thirty years. He enjoys playing at venues across Sydney and beyond. Alan plays the tunes everyone responds to. A Beatle's medley may be followed by a selection from Andrew Lloyd Webber or Gershwin, some movie or show favourites, a little Sinatra and perhaps some Billy Joel or Elton John. Patrons will enjoy requesting their favourite tune. Alan's likely to know it. After all, he's been entertaining with his velvet touch for more than thirty years. 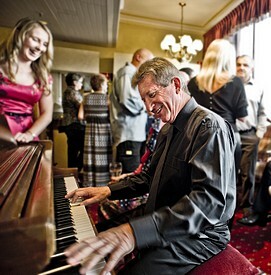 Never intrusive, Alan's piano repertoire is the perfect accompaniment to a perfect night out. dinner | weddings | cocktail parties | corporate functions | lobby piano | Christmas celebrations.